What’s more important than a ditch kit? One that’s up to snuff. 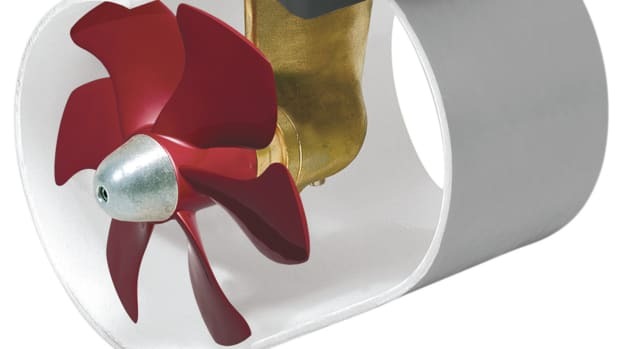 In an ideal world you would never leave your boat, unless you were stepping onto a pier or into a tender, but the prudent boater has a plan to vacate the boat in less-than-ideal conditions. 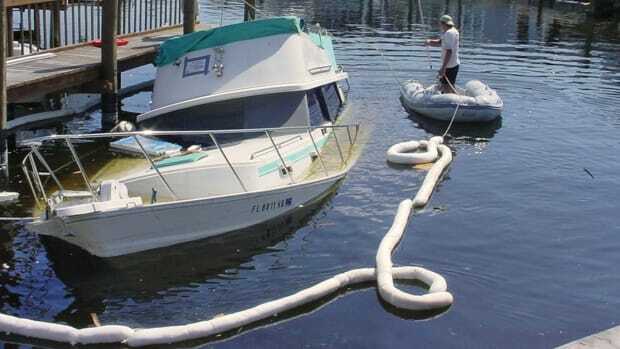 A ditch bag, or abandon ship bag, has long been an important piece of equipment for boaters making extended offshore passages. 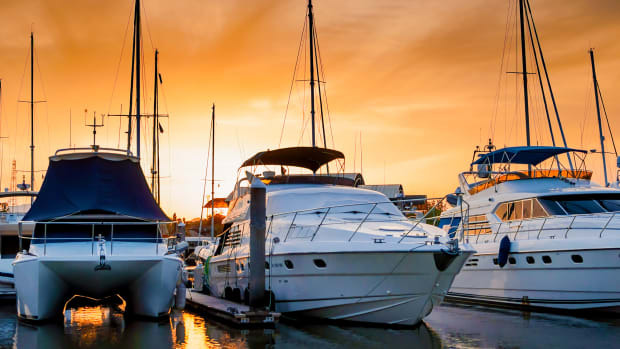 However, a ditch bag should be carried aboard any boat venturing into open water, even when your intended course is close to shore or in a large coastal body of water like the Chesapeake Bay or Long Island Sound. There are cases of boaters abandoning their vessels close to shore, only to be carried away by wind and current. A well-stocked ditch bag is imperative for survival at sea. Ditch bag manufacturers provide a comprehensive list of items to pack in that carry-on, so this column is not intended to repeat that information; rather, it’s to encourage you to think about how you would use a ditch bag and to set it up with those thoughts in mind. Begin by always keeping the ditch bag in the same location for every trip. It should be visible and within reach of the helm or a doorway. If you have multiple helms, take the ditch bag with you wherever you are operating the boat. Make sure all on board are familiar with the location. Imagine actually leaving your boat in an emergency. 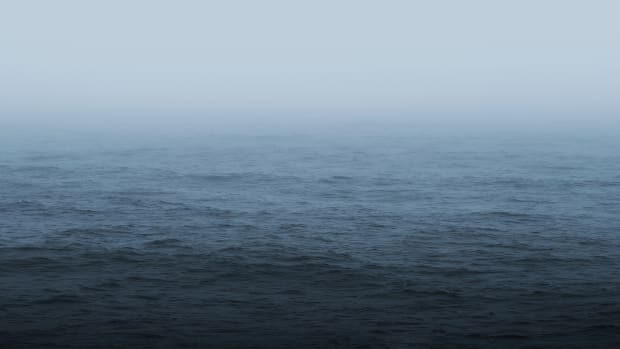 Abandoning a boat could be unexpected and chaotic—especially in rough seas. 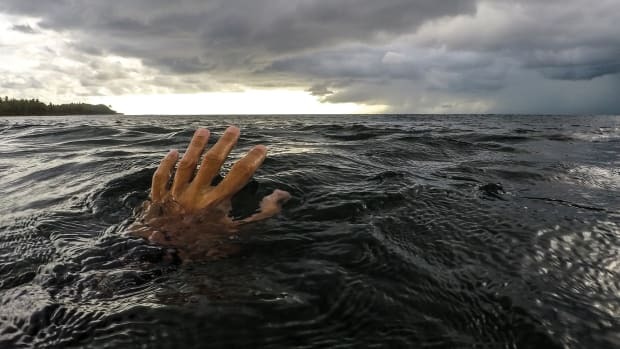 If you have to swim away from a boat on fire or to a life raft, you will need both hands, and survival instincts will likely cause you to let go of anything you’re trying to hold. The “bag” should float and have a sturdy lanyard that you can quickly connect to yourself or a life jacket. Make sure the ditch bag’s buoyancy is capable of supporting the contents; a floating ditch bag with 15 pounds of buoyancy will sink with 20 pounds of stuff in it. The primary purpose of a ditch bag is to carry devices that help you communicate with and be seen by rescuers. 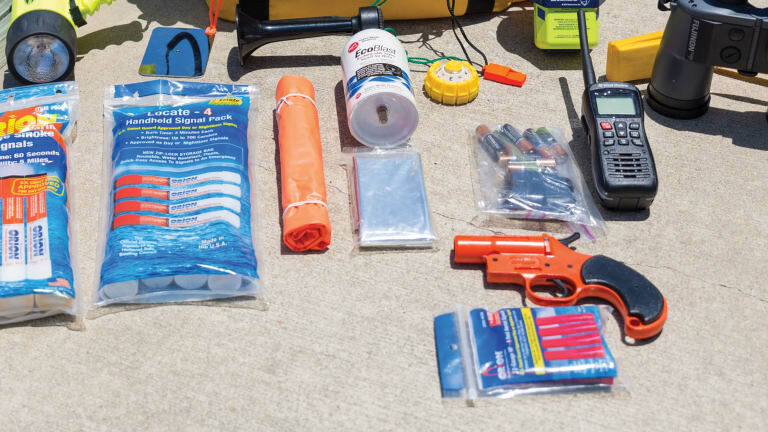 Additional items can be packed in the bag depending on the size of your boat and cruising or fishing plans, but they are supplemental to your life raft and its supplies—both are important to your safety aboard any boat in open water. In addition to having the bag secured to yourself, all contents should be secured to the bag by individual lanyards. The contents will be of no use to you should you become separated from them in the water. Attach a passive signaling device like a waterproof strobe light to the ditch bag as well. Using a roll-top dry bag as a ditch bag may sound like a good idea, until you realize it will no longer be dry or float once opened. Any items inside a ditch bag should be waterproof or capable of at least getting wet without harm. The most important item to carry in a ditch bag is an EPIRB or a PLB. 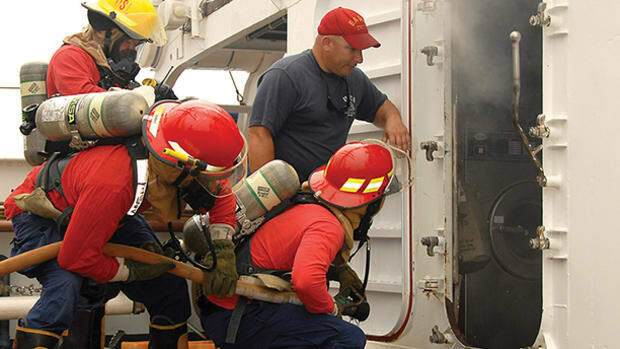 Even with a Category 1 EPIRB mounted to the vessel, a locator beacon should be carried with you as well. 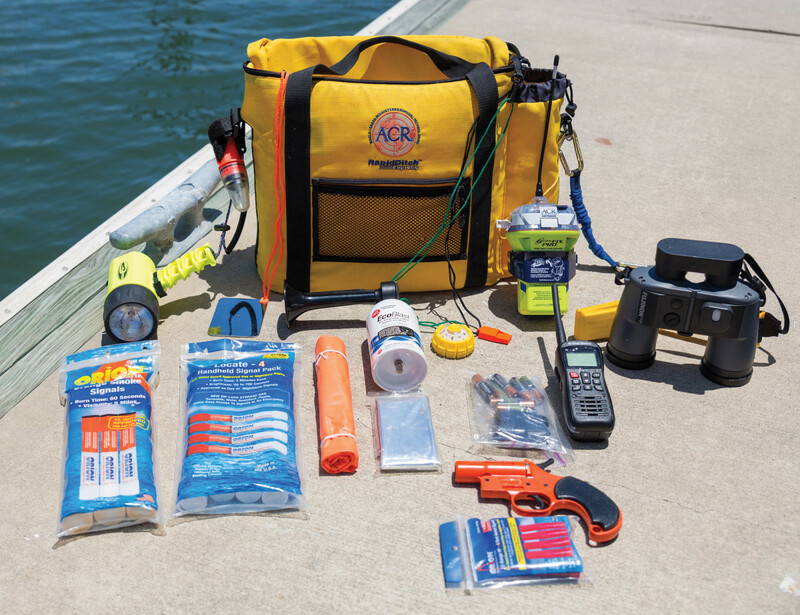 Remember, these signaling and communication devices may be used without abandoning the boat, so the ditch bag doubles as a simple and convenient way to keep these devices ready at hand. 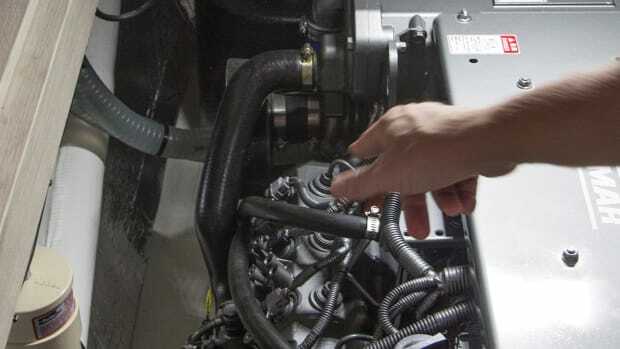 Once assembled and stowed within easy reach, your ditch bag needs to be maintained. Batteries for lights need to be inspected annually and changed as needed. Keep pyrotechnics within date and keep one expired set as well. 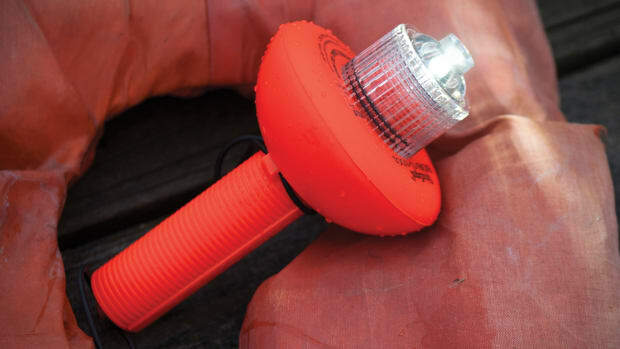 Newly available battery-powered lights that replace flares are also good additions. 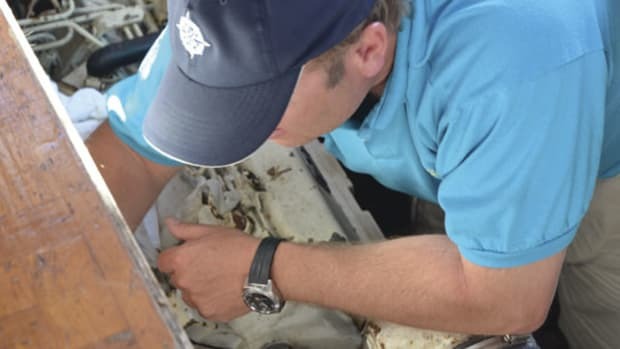 Good seamanship means being prepared for all circumstances, and a ditch bag that’s set up and maintained properly is an essential part of this strategy.